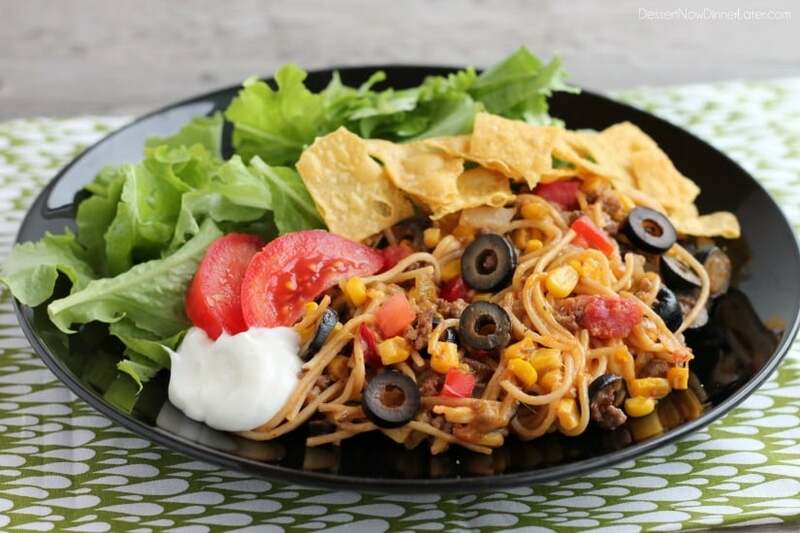 Taco Spaghetti - Dessert Now, Dinner Later! This post has been sponsored by Cans Get You Cooking. All opinions are 100% mine. 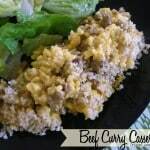 You know when life gets busy and you need a quick dinner that is both delicious and easy? 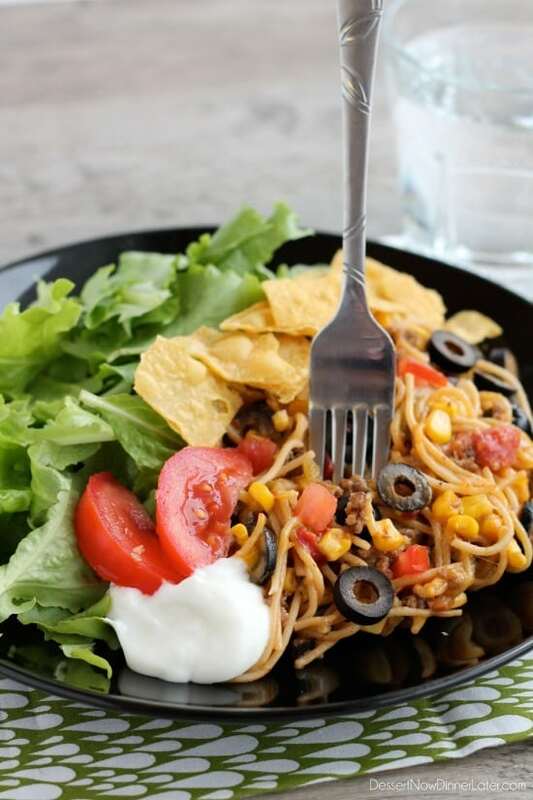 Yeah, this Taco Spaghetti is exactly that, thanks to several ingredients that come from my pantry! Now my pantry is totally organized (I’m a little OCD, what can I say?) and I definitely stock up on canned foods during case lot sales, which I love because I always have canned vegetables, soups, and fruits on hand all year round! The recipe possibilities are endless with these staple pantry items. According to a University of California, Davis study, many canned fruits and vegetables have equal, or more nutrients than their fresh or frozen counterparts. Canned foods seal in freshness, flavor, and nutrition, naturally. 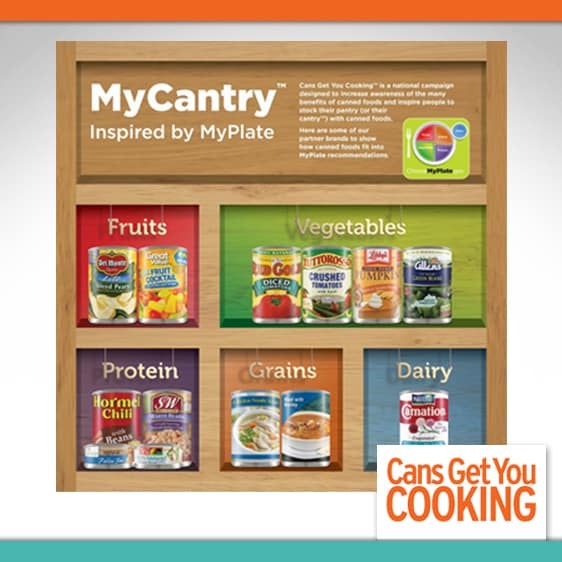 Cans help you save prep time and get a healthy, homemade meal on the table more often. This is why I prefer a well-stocked pantry – or “cantry” – to help make hearty, flavorful, nutritious meals I can feel good about, anytime. 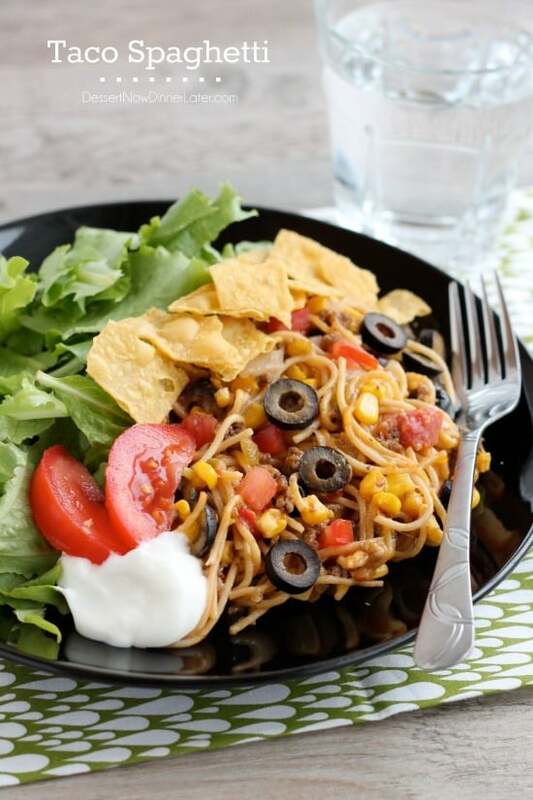 This meal uses canned corn, canned diced green chiles, and canned black olives that I keep on hand pretty much all year round! 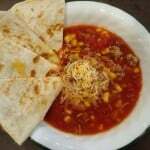 I just had to add pasta, beef, onion, taco seasoning, salsa and cheese for a delicious Mexican-Italian dish! 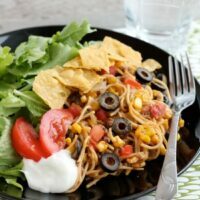 My kids loved the chips on top the best, but I loved that I had almost everything on hand in my “cantry” to make this! Cook pasta according to package directions. Drain pasta; set aside. In a 12-inch skillet or deep stock pot, cook ground beef and onion until meat is brown. Drain fat. Stir in water and taco seasoning. Add cooked pasta, corn, olives, half of the shredded cheese, the salsa, and chiles. Cook until the water is mostly absorbed. Transfer mixture to a lightly greased 13x9-inch glass baking dish. Cover and bake in a 350 degree Fahrenheit oven for 15 to 20 minutes or until heated through. Sprinkle with remaining cheese. 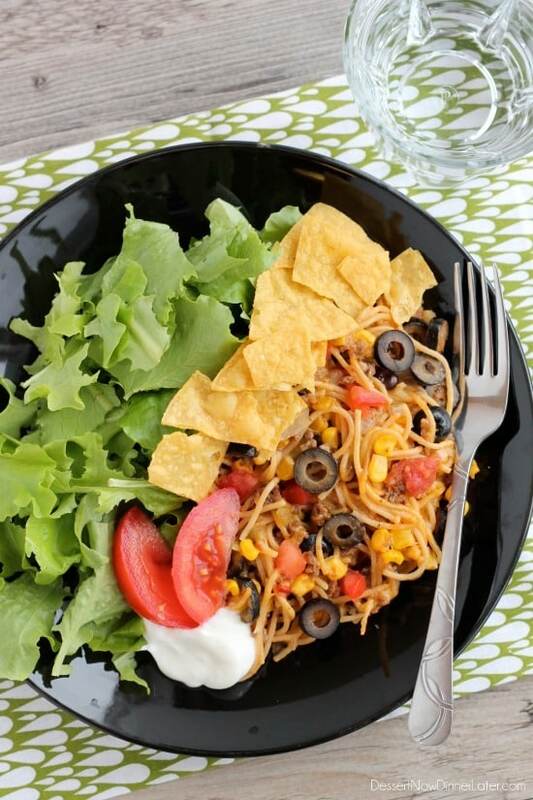 Serve with shredded lettuce, tortilla chips, and tomato dices or wedges. If desired, top with sour cream. 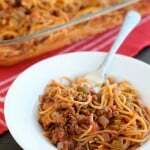 This reminds me a little of Cowboy Spaghetti–looks yummy! And I’m with you on keeping my pantry stocked with canned goods–It’s a must for me, especially on busy weeknights, to have what I need organized and on hand! I know! If I ever get in a time crunch I can look in my pantry and find something to make with all my cans! I love this! I never would have thought of changing up spaghetti like this. Looks delicious! We’re all about cans, too! I’ve never heard of Cans Get You Cooking. I’m excited to check out other recipes! I know! Kelsey Nixon did a whole series of recipes on the website! Go check them out! Pinning! 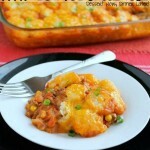 This looks so good to me right now, and I love the idea of Cans Get You Cooking. Thank you for sharing!! Thanks Audra! And thanks for pinning! What an awesome idea, Amber, never thought of doing this but can’t wait to make it soon! Love pantry meals like this! So flavorful!